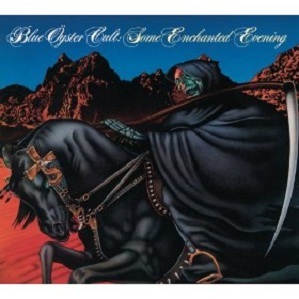 Some Enchanted Evening is the second live album released by American hard rock group Blue Oyster Cult. It was recorded on the tour to promote Spectres in 1977/1978. The first live album was On Your Feet Or On Your Knees which captured the group in 1974 but thanks to the success of the hit single Don’t Fear The Reaper and its album Agents Of Fortune, Blue Oyster Cult were a much better known group several years later. Originally it was a single album but in 2007, Some Enchanted Evening was reissued with seven extra songs. Because I can understand that some people may be concerted with links to the occult in the music, I’ve added links so that you can read the lyrics of the songs. While Don’t Fear The Reaper has a lovely melody, I have been concerned that it seemed to be encouraging a suicide between young lovers but the writer, Buck Dharma, says that it’s about eternal love and the inevitability of death where lovers will meet again. see Wikipedia. The version of the album I used to own only had the first seven songs which is frustrating. I always felt the original album was too short but the bonuses have made it a much better summary of the Spectres tour. It’s nice to see the ballad Astronomy feature on this album because I thought it was missing from the first but I could do without a, let alone two versions of We Gotta Get Out Of This Place. The 2007 extras pick up four songs already on the On Your Feet album so there can be a direct comparison made. These are weaker, less intense versions as BOC adjusted to their more AOR audience. Here is a video of Blue Oyster Cult performing Astronomy live in 1978. The original album was too short and even with the extras, it doesn’t feel like a proper concert recording because it doesn’t accurately reflect the order of the set lists. This is probably the weakest of the main BOC live albums despite it being the biggest seller. It lacks the guitar-fest punch of the first album and Extraterrestrial Live is a stronger career summary with a better version of Don’t Fear The Reaper. If this is the only BOC album you’ve heard, I encourage you to investigate the other two. I accidentally lost my copy and, with the exception of buying the mp3 of Astronomy, I’ve decided I can give it a miss. I’m surprised because I think On Your Feet is a much stronger album. Is this the best Blue Oyster Cult live album? Please vote in my readers poll. Some Enchanted Evening is nominated in the readers poll to discover the best hard rock / heavy metal album recorded live. This entry was posted in 1970s Live Albums, Heavy Metal Live Albums and tagged 1970s hard rock, 1978 live albums, Blue Oyster Cult Live Albums, Heavy Metal 1978 by Paul Simister. Bookmark the permalink.